N50 is a statistic that is widely used to describe genome assemblies. 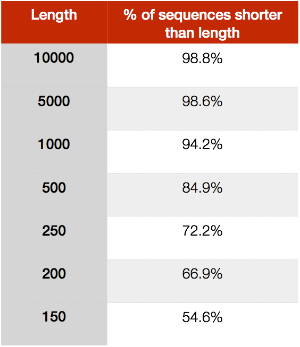 It describes an average length of a set of sequences, but the average is not the mean or median length. Rather it is the length of the sequence that takes the sum length of all sequences — when summing from longest to shortest — past 50% of the total size of the assembly. The reasons for using N50, rather than the mean or median length, is something that I've written about before in detail. The number of sequences evaluated at the point when the sum length exceeds 50% of the assembly size is sometimes referred to as the L50 number. Admittedly, this is somewhat confusing: N50 describes a sequence length whereas L50 describes a number of sequences. This oddity has led to many people inverting the usage of these terms. This doesn't help anyone and leads to confusion and to debate. We used a statistic called the ‘N50 length’, defined as the largest length L such that 50% of all nucleotides are contained in contigs of size at least L.
I don't know when L50 first started being used to describe lengths, but I would bet it was after 2001. If I'm wrong, please comment below and maybe we can settle this once and for all. Without evidence for an earlier use of L50 to describe lengths, I think people should stick to the 2001 definition of N50 (which I would also argue is the most common definition in use today). Updated 2015-06-26 - Article includes new evidence from Deanna Church.